These muffins are a great snack. They freeze well, and I eat them as I would a granola/Clif/Lara bar, but they have a lot less sugar, are fresher, and have more whole food ingredients. 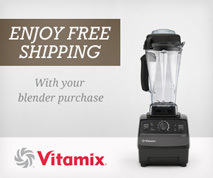 They’re more work to make than a smoothie, but you get at least 12 servings out of a batch, and they’re more portable. The recipe is inspired by a recipe I got from a friend who is participating in a human study on the effects of caloric restriction on aging/lifespan. There are some serious nutrition geeks in the study cohort, and one of them named Sherm came up with this recipe years ago. I presume he named them “mega” because of all the nutritious ingredients they contain. The original recipe is no longer online, but through the wonders of archive.org, I found it here. I’m an active guy who could stand to gain a few pounds, so I added in a bunch more calories from grains. The original uses psyllium husk (no calories, lots of fiber), and a few different kinds of bran; I replaced these with whole grains. If you’re looking to limit calories, you could easily sub the psyllium husk and bran back in. The recipe is pretty flexible. It has a lot of ingredients, but you can leave some out or make a substitution. When I make it I don’t worry too much about the consistency; I usually end up with something that is dense and moist. (The goal is to make a satisfying and nutritious snack, not an artful dessert.) If you want to make it vegan, you could substitute 4 Tbsp chia seeds and ¾ cup water for the eggs, and if you’re concerned about the egg yolks, you could make it with egg whites. I personally think whole eggs are fine (I choose pastured ones though). 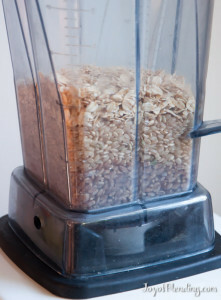 Using a Vitamix lets you to grind the grains fresh in whatever mixture you want. It also makes easy work of the wet ingredients. My basic workflow is: grind the grains, mix in other dry ingredients, dump dry ingredients into large mixing bowl, blend wet ingredients in the normal container, combine wet and dry ingredients in mixing bowl with spoon, pour into baking pan or muffin molds and bake. I use whey protein to boost the protein content. This time I used Trader Joe’s Vanilla, although I generally prefer straight whey. Preheat oven to 325 °F. The slightly low temperature is to minimize browning and heat degradation of nutrients. 2) Then add the remaining dry ingredients and blend them in (~10 seconds). Dump the blended dry ingredients into a large mixing bowl. 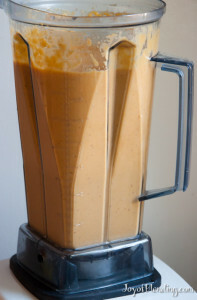 4) Blend the wet ingredients on high for not too long, say, 10-15 seconds. Since you’re not going to drink it as a smoothie it doesn’t have to be ultra smooth. 5) Grease your baking pan with olive oil–in the past I used a 9×13 glass baking dish, but this time I tried some new silicone muffin cups (these and these). The muffin form factor makes them cook more evenly. 6) Mix the wet and dry ingredients until they are well combined, and mix in the dried cranberries. 7) Pour into pan and bake at 325 °F. 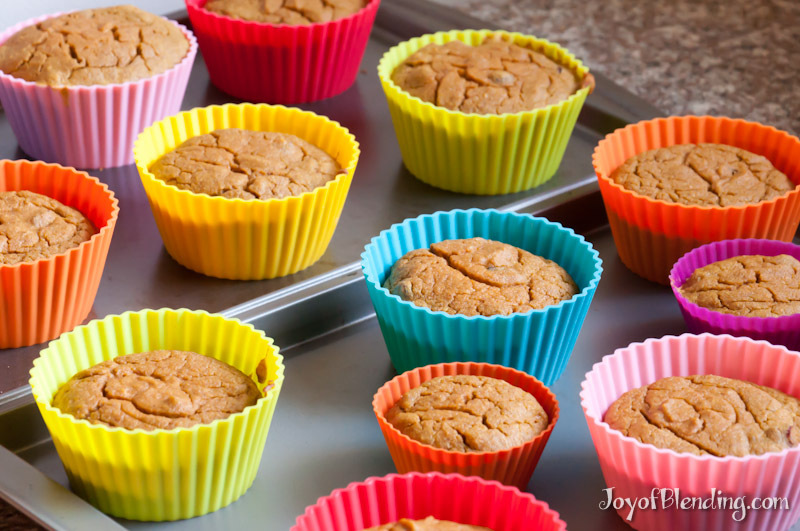 The 9×13 pan usually took about 50 minutes, but the muffin molds make it go faster. I cooked them for 30 minutes, although I had a few problems with my oven temperature, so I’m not sure what it actually was. I wasn’t sure when they were done, so I used a probe-type thermometer to check the temperature in the center. After a little searching online, 200 °F seems like a good target. If you don’t have a thermometer, you can poke one with a toothpick to make sure that it’s not too raw on the inside. I generally like to err on the side of less cooked though, because they will continue to cook a bit after you take them out of the oven. 8) Let them cool. I wrap each one individually in cling wrap and then put them into freezer bags in the freezer. When you want to eat one you can either pull it out a few hours in advance or defrost it in the microwave. I was curious about how the nutrition facts stack up, so I used the relatively handy tool over at NutritionData.self.com. If you input ingredients it will calculate nutrition facts for your recipe. Here it is for a large serving mega muffin (1/12th of this batch): 288 Calories, 9g fat, 44g total carbohydrate, 7g fiber, 11g sugars, 12g protein. For the calculation I added 10 grams of sugar to the total recipe because that’s the amount of extra sugar in the Trader Joe’s whey compared to the pure whey that is listed at Nutrition Data. For a similar serving size, these muffins have about half the sugar and more fiber and protein than a Clif Bar or Lara Bar. If you’re concerned about the fat (which I don’t think most people should be), you could remove or pare down the egg yolks and almonds. The great thing is that you can put in whatever you want. That is a very nice version. Sherm might not fully agree, but hey, you’ve got a different objective than he had. I’m now motivated to try my hand at a different version more like his but without anything containing gluten. Gluten now gives me a nasty set of hives…ugh! So no wheat, rye or barley for me anymore. I substituted egg white for whole egg sometime back to minimize intake of cholesterol. I’ll let you know what I come up with. 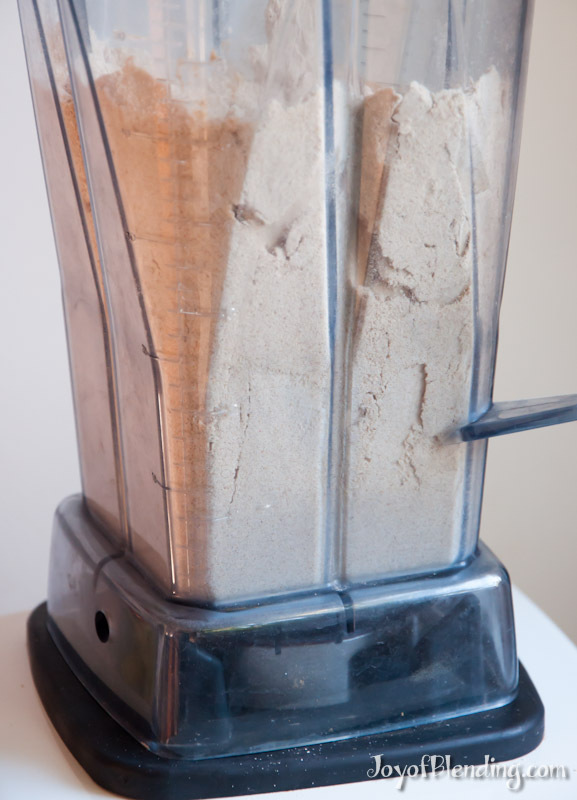 Another great thing about making this in the Vitamix is that it’s straightforward to make a gluten-free flour mix. Other grains that I didn’t mention but have been thinking about trying at some point include quinoa, millet, and buckwheat. I’ve never tried them, but I’ve come across gluten-free baking recipes that add xantham or guar gum to make up for the lack of gluten in gluten-free flours. I’m curious what difference (if any) the gum would make in a recipe like this. Hand-washing the silicone muffin cups was indeed a bit of a pain. The muffins didn’t stick, but little crumbs got trapped in the ridges, so I had to work the sponge around vertically to get into each ridge. I wish they made them without the ridges, since it seems that the ridges are mainly aesthetic. They are dishwasher safe though, so that might work better (I don’t have a dishwasher). It’s also possible that soaking them would help. The Amazon reviews are all positive and several mention easy cleanup, so I wonder if people are using a dishwasher, or it may depend on the recipe. One reviewer mentions using a toothbrush, which sounds like it would work well, but might also be a pain. turn the little silicone cups inside out to clean the ridges. It seems to spread the ridges apart and with a few minutes in soapy water (while I clean up) or in a dishwasher makes them come clean quite easily.